Born Israel Baline on May 11, 1888, in Temun, Siberia, Berlin fled with his family to America to escape the Russian persecution of Jews. They arrived in New York in 1893, settling in Manhattan’s Lower East Side. Compelled by poverty to work rather than attending school, Berlin made money by singing on streetcorners and later secured a job as a singing waiter at the Pelham Cafe. During this time, he also began writing songs of his own, and in 1907 he published “Marie from Sunny Italy,” signing the work I. Berlin and thereby establishing the pseudonym under which he would become so well known. Berlin continued his involvement in the burgeoning music industry as a young man, initially working at odd jobs in the neighborhood that was becoming known as Tin Pan Alley and eventually securing a job as a lyricist for the music-publishing firm of Waterson & Snyder. In 1911, his “Alexander’s Ragtime Band” became a huge hit and immediately earned him the title “King of Tin Pan Alley.” Entirely self-taught as a musician, Berlin developed a unique musical style by playing only on the black keys. Most of his early songs were therefore written in the key of F-sharp, but, by using a transposing keyboard, Berlin was able to compose in various keys. 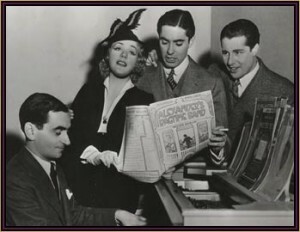 Berlin with the stars of the film ALEXANDER'S RAGTIME BAND, Alice Faye, Tyrone Power, and Don Ameche. 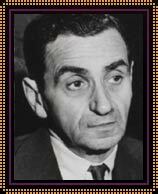 Established on the Broadway stage, Berlin took his musical talents to Hollywood, writing the scores for such hit musical films as TOP HAT (1935) and HOLIDAY INN (1942). One song from HOLIDAY INN, “White Christmas,” remains even today the best-selling song ever recorded. Written during World War II, the song’s great appeal lay in part in its evocation of an earlier, happier time, enhanced greatly by Bing Crosby’s mellow, wistful delivery. Berlin’s songs have also served as a rallying cry for the nation during two world wars. While serving in the Army in World War I, Berlin wrote patriotic songs for the show “Yip, Yip Yaphank” (1918), and in 1942 he wrote “This Is the Army.” The proceeds from performances of the latter totalled over 10 million dollars, and were donated to the Army Relief Fund. Berlin’s most famous patriotic work remains the song, “God Bless America,” written initially during World War I, but sung in public for the first time by Kate Smith for an Armistice Day Celebration in 1938. Berlin also wrote some of the most popular love ballads of the century. “When I Lost You” was written in honor of his first wife, who died within the first year of their marriage, and some of his most poignant songs, including the hauntingly beautiful “What’ll I Do,” “Always,” and “Remember” were written for his second wife, the heiress Ellin Mackay. Compelled by poverty to work rather than attending school, Berlin made money by singing on streetcorners. Berlin died on September 22, 1989 in New York City. His long, remarkable life seemed to illustrate that the American Dream was achievable for anyone who had a vision. He had received awards ranging from an Oscar to a Gold Medal ordered by President Dwight D. Eisenhower. He had become an icon of American popular music, rich and successful, and had helped shape the evolution of that genre through his use and adaptation of a variety of styles, despite a lack of education and formal training. Many of his songs had become an integral part of the tapestry of American life, accompanying representative scenes ranging from the idealized world of elegant dances by Fred Astaire and Ginger Rogers to the humble family fireside Christmas. It was his role as the spokesman of the American people as a collective whole — his ability to give voice to their fears, regrets, and hopes in a most compelling way — that constituted his great contribution to popular culture of the century.